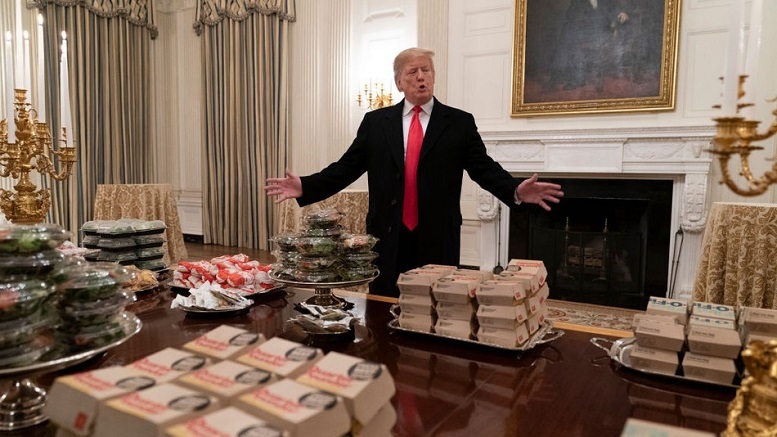 After noticing the large burger orders they received for the Clemson football team’s visit to the White House were placed as recurring daily orders, the major fast food outlets called today to confirm it was not in error. Their inquiries were prompted by the fact that over 300 burger of various types, together with a mountain of french fries, were still being delivered to 1600 Pennsylvania every day. They say they will continue to deliver the fast food on credit as originally requested. 1 Comment on "Fast Food Outlets Call White House To Confirm Recurring Burger Orders Are Not A Mistake"
Too cheap even to order the hamberders from Five Guys!?! And it’s not as though the Piece of Trump doesn’t have a major hotel of his own three blocks away.